at the same time. Don't let water damage your cover or the boat. Your Boat in ONE Easy Step! Includes both the Vent and Adjustable Support Pole! The price is right! You can find prices HERE. Place the support exactly where you need it for your particular boat. 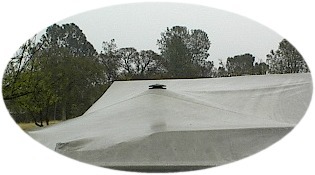 The Heavy Duty Vent allows air to properly circulate under the cover. No ripping or tearing of fabric from the upward pressure of the pole. The pressure is spread out by using the vent. Easy to Install! Simply cut a hole in the proper location on your cover and insert the vent top through the cover. The base of the vent attaches to the top of the vent with a "butterfly" wingnut, allowing you to place just the right amount of "squeeze" on the boat cover fabric.